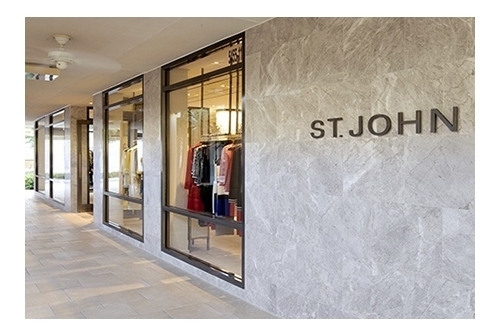 Our stylists are here to help you discover the St. John wardrobe that best suits you at the Naples St. John boutique. Whether it’s for an evening gala or updating your workwear, our stylists are there to provide you with the unforgettable shopping experience you’d expect from St. John. While visiting us, make sure to ask about our other client services including alterations, in-home delivery and one-on-one fit and style consultation. For more information please call us at (239) 254-0905. Featuring beautiful waterfalls, fountains, and lush landscaping, this open air Waterside Mall is one of our go-to places in satisfying our client’s wardrobing needs. Naples St. John is located on 5455 Tamiami Trail North in Pelican Bay and offers experienced Wardrobe Specialists who give attentive, one on one styling. The St. John Naples boutique offers the latest in women’s ready-to-wear fashion for everything from event looks to effortless vacation pieces. Discover the latest collections of our iconic jacket, dresses, effortless Sport pieces and more as soon as you step into St. John Naples. Our personal stylists are available every day of the week to give you a completely tailored and one on one experience. We practice craft and couture. With iconic American design as our heritage, we invite you to experience first-hand, the meticulous details, luxury craftsmanship, and one of a kind embellishments that have become synonymous with St. John Knits. Visit us at the St. John Knits Naples boutique and we will personally guide you through the range of St. John collections to see the effortless, alluring and refined clothing that has appealed to women all over the world since 1962.